#EXPERT EXCEL PROJECTS tweet Book01 | THiNKaha: Become a recognized expert in your field of expertise. Compelling thought leadership content. Excel detective Larry Moseley knows that critical corporate decisions are made based on the results of Excel spreadsheets, and a faulty spreadsheet can lead a company down a suboptimal route. 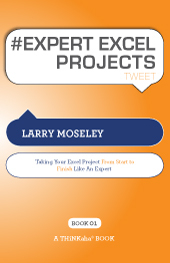 In #EXPERT EXCEL PROJECTS tweet Book01, Larry shows you how to plan and set up your next Excel project so that you speed up development and eliminate any later oh-no’s. This book takes you from start to finish on the subject, from storyboarding to final logic check. The knowledge it shares will directly enhance business analysis, financial analysis and forecasting models. Unforgettable experience and actionable guidance, presented in the popular tweet format, will find this collection a place on every executive’s bookshelf. Larry Moseley is something of a detective…an Excel detective. In a 35-year corporate financial career that has spanned the range from startups to megacorps, Larry has often had to analyze and make decisions based on Excel spreadsheets created by colleagues. And he has been constantly amazed at how frequently he finds errors in such Excel projects, errors of omission and of commission, sometimes glaring but frequently quite subtle. The danger, as Larry rightly points out, is that critical corporate decisions are made based on the results of spreadsheets. A company will often determine its strategy or chart a course of action based on the outcome of an Excel project, and a faulty spreadsheet can lead a company down a faulty or suboptimal route. Which is exactly why Larry has written #EXPERT EXCEL PROJECTS tweet Book01, dedicated to helping corporate executives and individual contributors develop expertise in planning and implementing Excel projects. Planning your Excel project well in advance speeds up development and eliminates any later oh-no’s. Larry debunks the myth that spreadsheets are intrinsically unreliable. In truth, they are the reverse, but inadequate or unclear thinking applied to their set-up can lead to erroneous results. Conversely, proper planning and implementing of any Excel projects invariably leads to better and more complete decision making. Much of #EXPERT EXCEL PROJECTS tweet Book01 is devoted to getting it right the first time, but the book also shows you how to review, analyze and apply an eagle eye to other people’s spreadsheets. This is particularly useful for senior decision makers, since they typically make decisions based on spreadsheets created by colleagues, vendors or consultants. Larry takes his readers from start to finish on planning their next Excel project, sharing his domain expertise at every step. Everything from ‘storyboarding’ the project to final confirmation–checking logic and doing a sanity check to make sure the project results accurately reflect the data. For any middle or senior executive, the knowledge gained from this book will directly enhance business analysis, financial analysis and forecasting models. Unforgettable experience and actionable guidance, all written in the ever popular tweet format, will find this succinct collection a place on every executive’s bookshelf. #EXPERT EXCEL PROJECTS tweet Book01 is part of the THiNKaha series whose 112-page books contain 140 well-thought-out quotes (tweets/ahas). #1 When starting a new Excel project it pays to plan ahead. Careful pre-planning can eliminate many common errors. #34 Excel calculates from the top to the bottom and left to right. Plan your headings across the top and data down the rows. #64 Testing separate sections of a complex formula will increase efficiency and save enough time to allow for writing documentation. #86 When potential inputs are static, use Excel’s various Form Controls such as Drop Down Boxes and Spin Buttons. #117 Congratulate yourself, because you have taken your Excel project from start to finish like an expert! Corporate Consultant and Financial Executive Larry Moseley has, in a stellar 35-year track record, applied his financial acumen within a range of corporate environments, from business startups to large corporations. Along the way, he has had to develop large, complex projects using Excel. He has also had to review and simplify existing projects, experience that shines through in this book. Larry has worked with spreadsheets since they were born. In the early 80’s he taught Lotus123, SuperCalc and Multiplan at local computer stores. Since then, the extensive use of spreadsheets, in all their complexity, has been second nature to him. He has taught Microsoft Office at Heald College and Cost and Management Accounting at Golden State University. Periodically, he shares his expertise through seminars in intermediate and advanced Excel topics. To learn how Larry’s experience can work for you, visit www.lwmcfo.com.